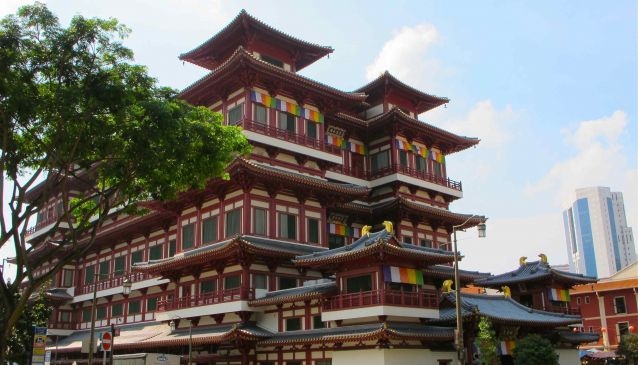 The Buddha Tooth Relic Temple and Museum (BTRTM) was founded by Venerable Shi Fa Zhao and opened only as recently as in May 2007. Dedicated to the Maitreya Buddha, meaning 'The Compassionate One' or 'The Future Buddha' the temple consists of four levels. The traditionally crafted roof tiles and roof ornaments are a striking landmark in the middle of Chinatown. Enter from South Bridge Road, also known as the Mountain Gate and soak in the enchanting atmosphere, the beautiful colors of the temple and the scent that lingers from the burning incense sticks. Three large wooden doors, heavy and red lacquered, welcome visitors into the temple following the tradition of the Tang Dynasty. All the timber was imported from Borneo. The first storey consists of the Hundred Dragons Hall and the Universal Wisdom Hall. Both are heavily decorated and a very popular subject for photos. The walls are filled with 100 Buddha statues, each of which has a name and specific hand signs, called mudras. Above hangs the gild keman, framed by Hundred Dragons. The temple is open from 7am to 7pm every day, including public holidays. However, you can access the museum, located on the 3rd floor, only from 9am to 6pm. Here you can find Buddhist art and artifacts, some of which are of great historical value and each telling the world the life story of Buddha, the profound meaning of His Teachings and the rich culture of Buddhism. The relic chamber houses the Sarira, commonly known as relic, which carries the spiritual energy, left behind after the death of a sage. In Buddhist belief, seeing a relic is as good as seeing the Buddha in person, as good as learning the Dharma and knowing nirvana. Guided tours are held every Tuesday and Thursday at 2pm, free of charge. Don't miss the rooftop, filled with Buddha Tooth orchid plants, pagodas, and a large Buddha Prayer Wheel in the centre. Wear appropriate attire to show respect; no bare backs, off-shoulders, shorts, mini-skirts, etc. Strictly no non-vegetarian food and pets inside the Temple.